Bidding contests for sporting and cultural events are attracting increasing media and public attention. Yet, despite the cost, size and scale of these bidding contests, relatively little academic attention has been paid to the strategies and tactics used to develop successful bids. 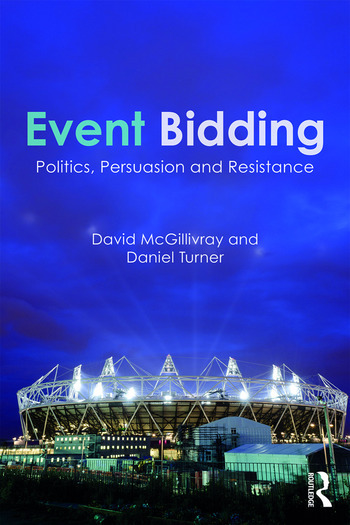 Event Bidding: Politics, Persuasion and Resistance develops a comprehensive, critical understanding of the bidding processes surrounding the award of major peripatetic events. This is achieved by drawing together existing knowledge on the subject of event bidding, combining this with historical and contemporary examples to enable a critical commentary on the bidding process itself and the struggle for power that it represents. The text draws on case studies of ‘mega events’ including the FIFA World Cup and the Olympic Games as well as a range of smaller peripatetic events from across the world to analyse the bidding process and some of the increasingly controversial issues which emerge during often lengthy and expensive bid campaigns. Finally, the text reflects on a range of critical issues of contemporary significance in bidding contests, including the growing ethical and governance issues surrounding the development and award of events as well as the impact of growing oppositional movements surrounding each contest. This timely volume brings theory and practice together in one place to produce a critical appraisal of a phenomenon with a relatively recent history and is particularly suitable for students, researchers and academics of sports, events, tourism and related subject fields focusing on the strategic and political dimensions of major events. Marseille-Provence 2013: "The unquenchable thirst for creative destruction"
David McGillivray holds a Chair in Event and Digital Cultures at University of the West of Scotland. His research interests focus on the contemporary significance of events and festivals (sporting and cultural) as markers of identity and mechanisms for the achievements of wider economic, social and cultural externalities. Daniel Turner is the Senior Lecturer in Events and Tourism at the University of the West of Scotland. His research interests focus upon the socio-cultural exploration of events and sport and the use of such activity to generate economic, social and cultural impacts.